After saying “Aloha” just 6 years ago, Aulani Resort has distinguished itself as one of the islands’ most acclaimed resorts, including Best Family Beach Hotels, 2016, from Travel + Leisure Magazine. 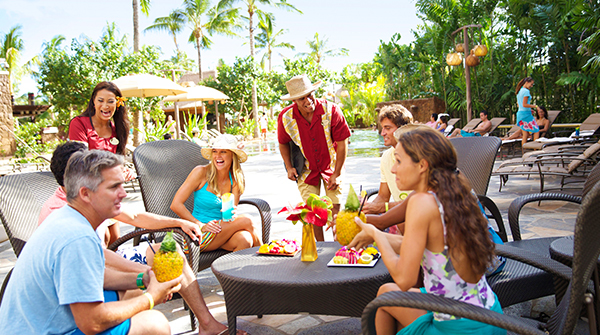 Great savings are in full bloom this spring with up to 30% on stays of 5 or more consecutive nights in select rooms at Aulani Resort most nights April 9 through June 7, 2018. These rooms must be booked by May 9, 2018. Look What’s INCLUDED with your stay ! Look at the exciting additional experience you can also purchase while there! Savings based on the non-discounted rate for the same room. The number of rooms allocated for this offer may be limited. Limit 2 rooms per reservation. Excludes suites and 3-Bedroom Grand Villas. Additional charges may apply if more than 2 adults per room. Cannot be combined with other discounts or promotions. Advance reservations required. Contact Destinations with Character Travel Agency today to take advantage of this tremendous offer before it washes beneath the waves forever!